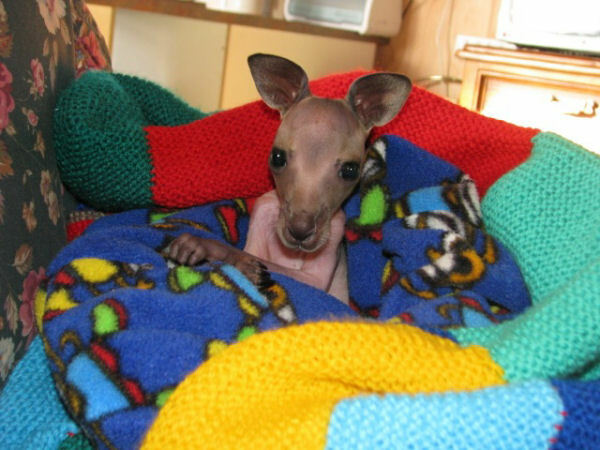 This little kangaroo has been named Cooper, after the little boy who found him on his way to school. "Cooper's mother was hit by a car and is now in heaven", reports Stella Reid of Wildhaven Wildlife Shelter. Wildhaven was totally destroyed in the February bushfires in Victoria this year (2009). 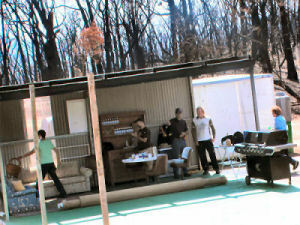 You can read about it in "Steve Irwin's dad visits Wildhaven after Black Saturday bushfires". Cooper and Stella go for walks in the National Park and watch wallabies and wombats. At night Cooper lives in a shed, where he is warm and comfortable. I have a feeling that Stella and Allen live in the same shed with him, since their buildings burned down in the worst bushfires in Australian recorded history. I have not, however, been able to confirm this. Stella says that Cooper knows what it is like to lose everything and still find love and hope. "Happiness is a journey not a destination and together with my new family I begin that journey." And, as Maryland Wilson, President of the Australian Wildlife Protection Council (AWPC), says, "Stella must also be happier now that there is a baby in the house again." Alan, Stella and Cooper in Wildhaven send their love and thanks to their supporters. Cooper is not the only animal they have contact with in the area of the fires, but he is their first new rescue case. Some of the animals they knew before have returned to see them. They put hay out for them because little grass is growing back, perhaps because the soil itself burned. The soil contains living creatures and, notably, mychorrizal fungi, which are essential for long-term nourishment of forests. Mychorrizal fungi can withstand very high temperatures, but maybe these fires were too much for them. Please state there: "for Stella's kangaroos"
The PayPal option might be the most convenient for International donations.